As I look at Bette’s painting, I am struck by the smallness of John, his fragility, his humanness. It’s this little baby held in Elizabeth and Zachariah’s arms, this fragile gift who can do nothing for himself, who will grow to smooth the rough places, preparing the way for the Lord. But it's not just a task for when he's strong and grown. At the most fragile time in his life, when he still needed the safe, cushioned warmth of the womb to survive, this baby was already preparing the way for the Lord, leaping inside his mother at the approach of his unborn cousin, Jesus. How amazing that we in our human frailty, as well as our moments of strength, can go before the One who goes before us—the One who invites, summons, and does for us everything we cannot do for ourselves—to prepare his way! 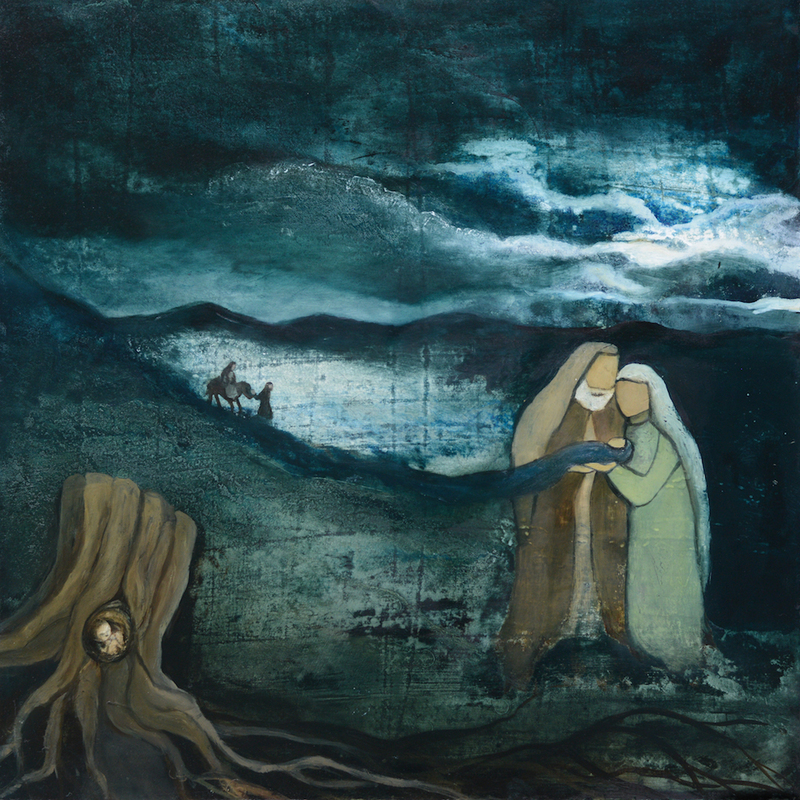 I love the way Bette’s Advent paintings all show our story interwoven with His story. The infant Jesus doesn’t just descend from heaven, invading earth to save it as one unconnected to it. He grows as a shoot from the apparently hopeless, severed stump of Jesse, the slowly unfurling fulfillment of the promises to Abraham and Isaac and David. To be sure, Jesus is fully God—Emmanuel, God with us. But he is also fully human, with (very!) human ancestors; he is Mary’s biological son, David’s great, great grandson. Heaven doesn’t just touch earth, visit it, or invade it. Heaven enters it in the fullest way possible, God weaving God’s self into every cell of a human being, and thus into the personal histories of us all, for we are all, through Adam, connected to Jesus' story and he to ours. Baby John, tiny and helpless, miracle and sheer gift (as every human is! ), this vulnerable little package of flesh and spirit, is filled with Spirit and given the honor of going before the Lord, smoothing his way. John’s story is interwoven with Jesus’ story, John himself filled with Jesus' Spirit to enable this interweaving. Our stories are all interwoven with Jesus' story, each of us graced with a unique way to pave his path or bear him into the world, a way that flows as much from our own personal set of frailties as our strengths. Yes, John was specially chosen and called. But so are you. And so am I. Advent may be almost over, but it's not too late to let Bette's beautiful Advent paintings and accompanying devotional help you soak in the wonder of the Christmas story. Explore Bette's work here, savor her Advent devotional, "A Pregnant Pause" here, or sign up here if you'd like the devotional deposited directly into your inbox. So excellent to see this perspective. And for some reason paintings fill out the story for me. I love this one, Carolyn. Thank you and God bless you this Christmas. A really helpful and thoughtful piece. It is so good to look at those early beginnings of John. Thank you. Just one small point – we have been so coloured by images that we forget what scripture doesn’t say. Did Mary ride a donkey? Nowhere in scripture does it say so. That of course doesn’t mean she didn’t but rather like 3 gifts 3 kings we make facts of what isn’t there. Good point, Maryann. Thank you. Thank you for sharing these thoughts. Particularly on The interweaving of our stories and the grace of each of us in our frailties still being chosen & called. I can’t wait to share with coworkers tomorrow.